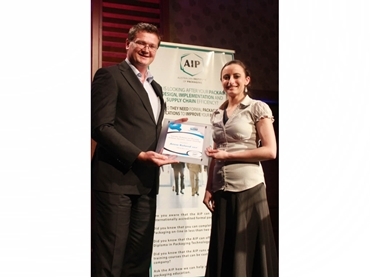 Australian Packaging and Processing Machinery Association (APPMA) announced the winner of the annual scholarship program during the 2012 AIP National Conference held recently at the Marriott Surfers Paradise. The APPMA scholarship enables one person each year to study a Diploma in Packaging Technology program. The APPMA scholarship program has been running for four years. Mark Dingley, Chairman of the APPMA announced Anna Roland, Technical Officer at Betta Foods Australia as the 2012 APPMA scholarship winner. According to Mr Dingley, Anna has had the opportunity to work within the food and packaging industries and has completed various projects including assisting in film sealing, which was her first exposure to the complexities involved in designing and implementing successful packaging solutions. Anna Roland believes that the APPMA scholarship gives her the opportunity to develop her understanding in both the design and practical aspects of packaging. She also hopes that the learnings from the Diploma in Packaging Technology will provide greater support to the production floor and in the development of new products by her company’s marketing and technical teams. Anna will commence her Diploma in Packaging Technology program this year.